How To Read Coupon Matchups! 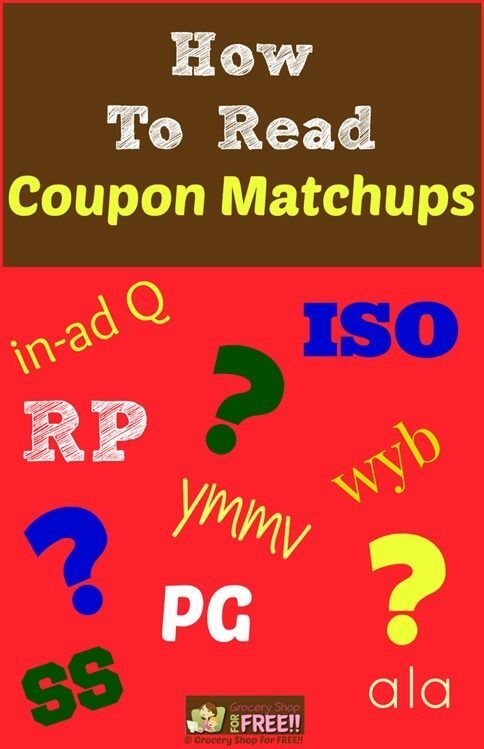 You are here: Home / Finance / Couponing / How To Read Coupon Matchups! How To Read Coupon Matchups! There are a multitude of places you can find matchups online. Matchups are where people like me match a coupon, app offer, or other deal offers (or many at once that we call “Coupon Stacking“) to a sale or price that makes it an even better deal! That’s what we call a matchup. As many places as there are to see matchups online there are just as many different ways to write them. Many of them are written with abbreviations we use to help us write them up faster. On average I would say a person like me might write up as many as 30 a day, and that’s not counting the lists of matchups we do for one store. The abbreviations help us get the information out there faster. So, for you, the reader, it can be confusing if you don’t know the abbreviations or “Coupon Lingo” and don’t know how we think when we are writing the deals up. Pretty much every day I am asked a question about a coupon matchup. So, I thought I would take some time and share with you How To Read Coupon Matchups. We forget sometimes that some people are learning and don’t know all of the Coupon Lingo, yet. The final price (FP) once you follow all of the above directions will be as low as (ala) 2 for $1.04 or $0.52 each. However Your Mileage May Vary (YMMV) because your store may not have it in their ad. There are a lot of different abbreviations we use to make a deal shorter and as time goes on you’ll get the hang of it! You can always refer to the Coupon Lingo page I have set up with the abbreviations. That will help you “interpret” the deal until you get used to it. So, this one is for CVS. When you purchase one of them you’ll get $2 back (at checkout) in Extra Care Bucks, you can only do the deal 2 times and get the $2 Extra Care Bucks twice. The coupons that have underlines mean they are printable and if you click on them you can print them out. So, for this deal there are several coupons that will work – BUT NOT all together. You choose which one you have and want to use. The first 2 are $1 off 1 printable coupons for the products listed on those lines. The next one is saying there is a coupon in the Proctor and Gamble Sunday Newspaper Coupon Booklet from the week of June 1st that you can use – but, it can be a $.50 off one or a $1 off 2, or a $2 off 3 – depending what came in your newspaper (coupons are regional and have differing amounts often). The next coupon is one that you might have gotten already or may still be available at your CVS when you scan your CVS card at the Red Coupon Center at your store that prints out coupons. The next one says that you can click and print a $.50 coupon that is on Coupons.com. Finally, the final price is as low as FREE depending on which coupon you had and used. I hope that I was able to help you understand better and that I didn’t confuse you more. I know though, that it will most definitely get easier as time goes on to read these matchups. If you have more questions about couponing be sure to read my Grocery Shop For FREE info and get started! I very new at couponing. I’ve been wanting to learn for years, I’m I’ve asked several people that I’ve seen in the stores using coupons and have asked them if they were willing to teach me but always got turned down. Do you know anyone in or surrounding areas near Orem that would be willing to teach me? I would really really appreciate it so much!!! Years ago I was just like you. I TOTALLY get where you’re coming from! I don’t know anyone in your area – but, I have you covered!